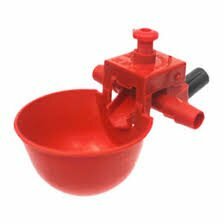 The Auto Cup Drinker is indicated for the supply of clean and fresh water for poultry with minimal use of manpower for constant refills. These cups are very reliable, durable, and are brightly colored to attract the chicks and birds in general, thus they are ideal for broilers, breeders, layers, pullets, ducks and other similar birds. As a bird drinks, reduction in water levels in the cup automatically triggers a mechanism to refill the cup. Once the water gets to a particular level, a negative feedback mechanism adjusts the valve to stop the supply of water to the cup. For more information on how to use this drinker, please watch the attached videos. As the common floor drinkers (for chickens) can be easily emptied by knocking over if not correctly positioned; as well as having dirt and debris raked in by the adventurous birds, these make it difficult for the chicks and birds to get access to clean and fresh water. 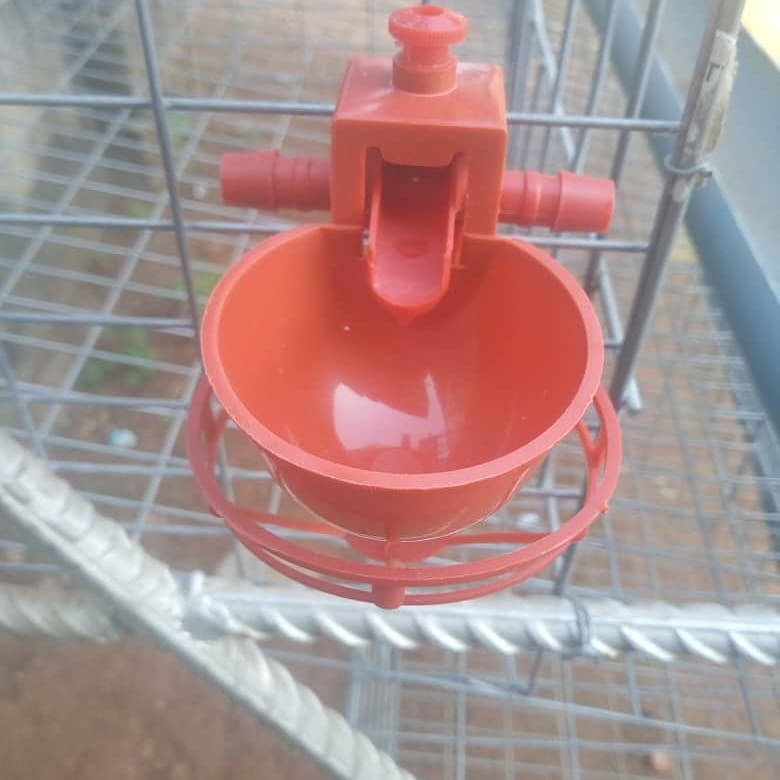 This auto cup drinker thus comes well recommended for all poultry farmers as an easy, high quality and sanitary solution to watering chickens. 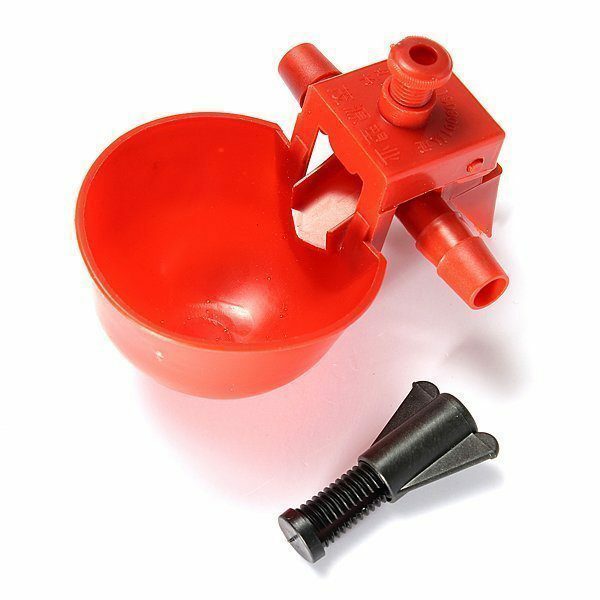 It is made of heavy plastic with a drinking cup which can serve up to five chickens. Simply push them directly into a water container or into PVC piping in a low-pressure system. This cup style drinker comes with a built-in trigger. 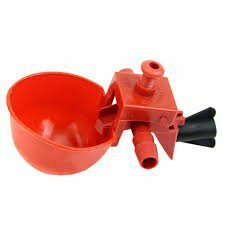 This model is for mounting the drinker directly to you waterer, whether it be a bucket, pail, large pipe etc. Simply drill a 3/8″ hole into your bucket and thread on your drinker (Use drill 9mm drill a hole at PVC pipe, or any other container then push it.). Cup utilizes a trigger system that automatically fills when the chicken pecks it. You can design your own drinker system and add as many cups to buckets or large pipes as you wish up to 210 drinkers per system. Drinkers work under low pressure at 5 psi or less. These drinker Cups are an innovative way, the best easy designed to water chickens. Chickens drink from the cup, can adjust the water amount manually. Easy and safe to use, easy installation with nuts screws included, very convenient. For home and commercial poultry farms use. Suitable for: The pipe diameter is 9.5 mm. 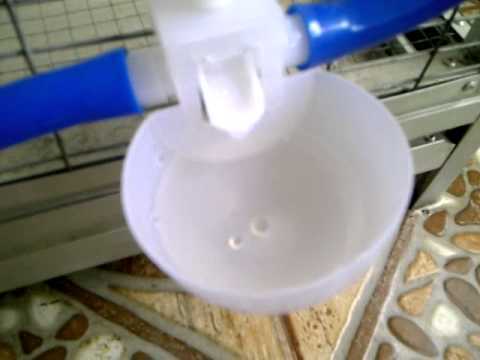 The attachment can used to connect the drinker to a 3/4 PVC water pipe.